Congratulations GF … what a precious baby! CUTE! And gorgeous croissants. I’m envious! Really am!! Lovely croissants and congratulation on your first grandchild. Such a sweet picture! These look so wonderful! I love to bake breads of all kinds, but have never tried croissants. Watching a video is a great idea – I’ll have to try that with the more intimidating things I try to bake! Your grandson is beautiful – – you must be so excited!! Congratulations with the birth of you’re grandson. He looks adorable on the pictures. You’re croissants sure do look delicious. Great job. Fantastic job on your croissants! They look wonderful! And super congratulations on your first grandchild!! He is adorable! Gorgeous! Great job on the challenge. oh my goodness, what a cutie! congrats! Congratulations….the lovely new grandma !!! I love your croissants !!! 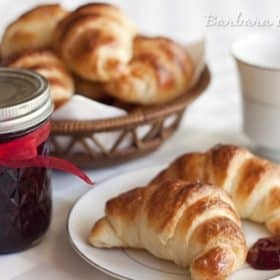 What wouldn’t I do to get a batch of your freshly made croissants !! Barbara, congratulations on your newborn grandson. Isn’t he looks super adorable! I’m sure everyone is waiting patiently for his return. Btw, your croissants look as fabulous. Thnaks for sharing. These look simply awesome..much better than bakery stuff! 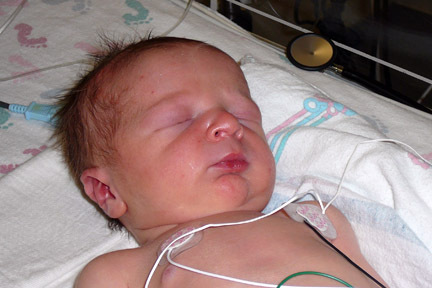 Congrats on such an adorable grandson!! 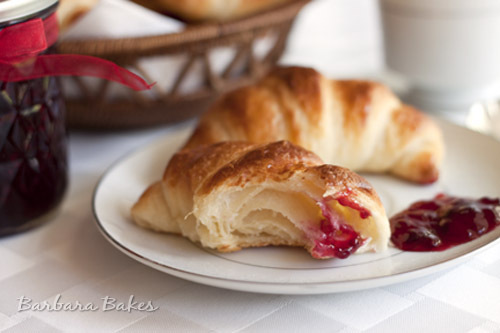 Your croissants look fabulous, and congrats on your first grandbaby! He is beautiful. What a delicious looking grandbaby! Congratulations! He is a very lucky little boy to have such a fabulous grandma! I am looking forward to future posts featuring you cooking with him! So buttery and tasty! Well done! 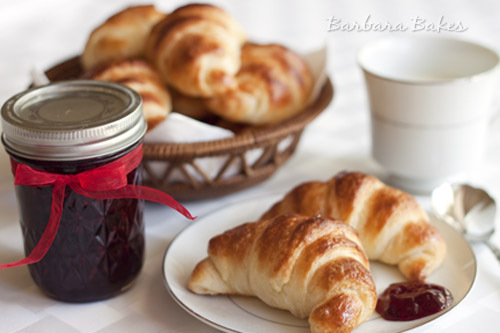 I love everything about this post – the croissants, the jam, and the new baby! Congratulations Grandma! Thanks for all the sweet comments about the croissants, but especially about my grandbaby. He’s an angel. 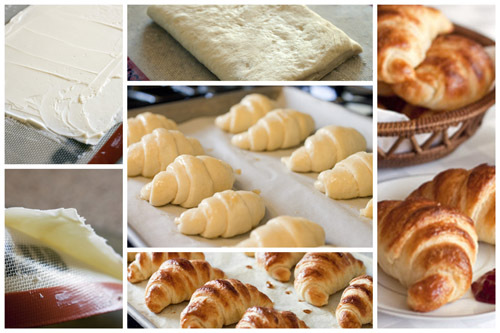 Your croissants look perfect for the first try. I wish I could try your jam, it looks soooooo good. Aren’t videos wonderful to have to look at. I just recently watched a Ciril Hitz video on preparing the butter rectangle for croissant dough. Maybe I’ll try your recipe and incorporate his tips that I saw. Thank you!!! Congrats on baby evan. He is adorable and just so peaceful and sweet. I hope your daughter is doing well and they are both in my prayers!